The exhibition presents an extraordinary man, a great Pole who was a prisoner of German Nazi death camps (Auschwitz and Dachau) from 1939 to 1945. 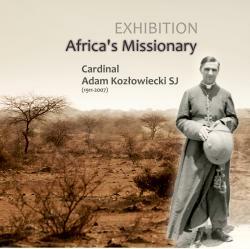 Adam Kozłowiecki was also a missionary in Northern Rhodesia (Zambia) from 1946-2007. He was born in Huta Komorowska, in 1911. During World War II he was a prisoner of the German Auschwitz concentration camp where he was sent on June 20th, 1940 and received the number 1006. Six months later he was transferred to Dachau concentration camp where he remained until the end of the war. After World War II ended, at the request of his religious superiors, he wrote a book entitled ,,Ucisk i Strapienie. Pamiętnik więźnia 1939-1945”, (“Oppression and distress. A Prisoner's Diary 1939-1945). The book was translated into German in 2016. In 1946 Northern Rhodesia (Zambia) became his second homeland by choice. As a Jesuit missionary, he organized education there. He was the Apostolic Administrator of the new Prefecture of Lusaka, and the first Metropolitan Archbishop of the city He participated in the sessions of the Second Vatican Council in Rome. On 21 February 1998 he was created a Cardinal by John Paul II. The exhibition is the creation and initiative of the Cardinal Adam Kozłowiecki Foundation, co-financed by the Ministry of Foreign Affairs in Poland, as part of the Cooperation in the Field of Public Diplomacy 2017 project, for the presentation of the exhibition in Rome. "In Nomine Domini. Africa’s Missionary", was presented on October 10th, 2017at the Pontifical University Urbanianum in Rome. Many distinguished guests from around the world were present for the opening of the exhibition. It was at the General Audience with Pope Francis in the Vatican on October 11th, 2017 that the whole world heard about "In Nomine Domini. Africa’s Missionary". After Rome, the same exhibition was presented around Poland. The exhibition is in Polish and English.